Since Marvel released the first 10 minutes of the Cap sequel, let's look at some of the comic connections found therein! I'm not normally one to watch footage before a movie's out, but I wanted to see what all the hubbub was about. Obviously, if you got this far, there are spoilers for the first 10 minutes of the flick. Cap makes a list of things he's missed while spending time as a Capsicle. It's a good list so far, but supposedly this list will include at least one fan-selected BBC show. I'm hoping for Doctor Who, if nothing else. Oh, and it's interesting to note that Star Wars was crossed out and replaced by Star Trek - somehow that seems like the kind of suggested change Tony Stark would make. He's always been more into science than magic anyway. The first guy Cap talks to in the film is obviously Sam Wilson. He's got a really convoluted origin in the comics, but suffice to say, Sam Wilson is a community activist who moonlights as a superhero. He started off as an experienced fighter with a mental connection to his pet bird Redwing, but he soon gained a flying harness (currently using hard-sound wings) and the ability to communicate with all birds (which means every pigeon in New York City can be his eyes and ears). Oh, and he's not a mutant. Redwing probably wont make it into the film, but he is a member of his own team, the Pet Avengers. 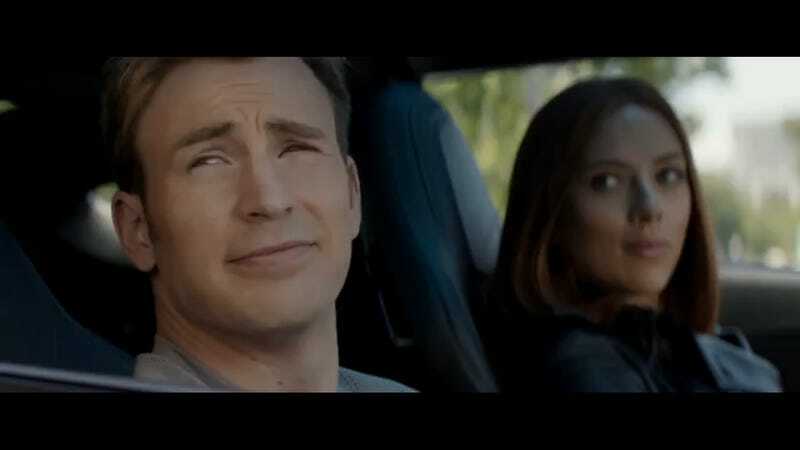 Cap meets up with Black Widow, who suggests he hook up with either Kristen in SHIELD's statistics department or that nurse who lives across the hall from him. Probably nothing, but Marvel does have some prominent nurses. In particular, Nellie the Nurse had her own 1940s comic, concurrent with Captain America's original series, and romance character Night Nurse eventually became a superhero in her own right, although her primary duty is patching up other superheroes. Cap and Widow meet up with other SHIELD agents, including Brock Rumlow, who comic fans know becomes the Bane to Captain America's Batman. He even took credit (albeit briefly) for an assassination attempt on Cap. Keep an eye on this dude. I dunno why, but when I see him use that electric cattle prod, it makes me think of Marvel's worst hero: The Crippler. This guy's whole deal was that, whereas Punisher would kill criminals, he would torture them for a long while but leave them alive. Somehow he joined a superhero team alongside one of the former Buckys (more on them some other day). Cap's mission is to take out a pirate operation by the mercenary Batroc. In the comics, Batroc the Leaper (or "Batroc ze Leaper" if you prefer) is contradictorily both the biggest joke among Cap's rogues gallery and one of the most skilled fighters Cap has ever fought. Jasper Sitwell is the Waylon Smithers or Owen Burnett of the Marvel Universe. Quiet, unassuming straight-laced and loyal guy who can really get the job done (despite everyone else underestimating him). I'm not sure why it would be relevant, but the SHIELD database there specifies that the cinematic version of Sitwell is Honduran American. He's appeared in several Marvel stories so far including Thor, The Avengers, some Marvel One-Shots and episodes of Agents of SHIELD. More in a few months, when Captain America: The Winter Soldier officially premieres!